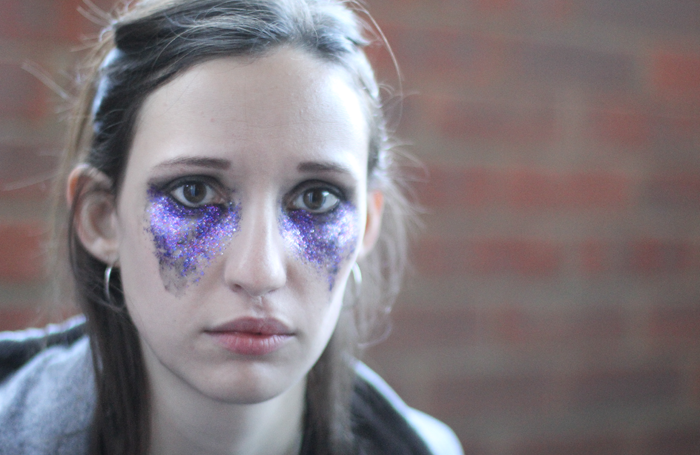 Riot Theatre’s Glitter Punch is a knockout of an emotional rollercoaster. Written by Lucy Burke it begs for a longer run at the Vaults. Set in Salford, we quickly become captivated by sixteen-year-old Molly’s (Emily Stott) outlook, interacting with the audience throughout as we see her develop feelings for a boy who she spots outside smoking on her first day of college. As Molly meets John (Antony Fagan), a ‘posh boy from the south,’ we watch her discover feelings she has never experienced before. Naively fumbling and narrating her way through her first sexual encounters, Molly’s dialogue is met with continuous laughter from the audience who can relate. As the play continues we see the couple’s relationship flourish, and you cannot help but smile from seeing how Molly has finally found an escape from her dire home life. Living with her Mother’s boyfriend ‘Knobby Steve’ and their baby, Molly comes from a world which lacks opportunity and excitement. However John invites her to experience things such as seeing a beach for a first time and is the first person to tell her he loves her. Although he seems much more confident and in control of the relationship, John still opens up to Molly. As the play continues you start to question what can possibly go wrong. The pair seems so connected, emotionally and physically, aided by Peter Taylor’s beautiful direction and moments of breath that weave throughout. However through the glittery haze of young love, Burke delivers a plot twist that no-one see’s coming, leaving you reevaluating everything you have just watched and highlighting how vulnerable a sixteen-year-old’s life can be. Glitter Punch runs through 4 March.